How sharp does the text really need to be? If you've ever found yourself looking at an e-ink e-reader and thinking, sure, this is sharp but is it sharp enough for my insanely good vision, then the Kobo Aura HD could be the answer to your 20/20 prayers. The latest ereader from the Canadian company, the Aura HD boasts 265dpi resolution on its 6.8-inch e-ink screen, which dwarfs the Kindle's 167ppi and the Paperwhite's 221ppi. Anyway, that Pearl E Ink touchscreen comes with a 1GHz processor behind it and 4GB of built-in storage which you can expand up to 32GB. 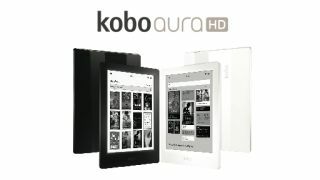 The Aura HD is what Kobo says is the most even front-lit ereader and it promises battery life of over a month. There's no 3G edition, but you'll be able to use Wi-Fi to browse the Kobo eBookstore and you can set your books to display in one of 10 specially-designed fonts in 24 sizes. "To us, the Kobo Aura HD is the Porsche of ereaders and is designed for those in the driver's seat of their ereading adventures," he proclaimed. Yes, we're often wishing we could better control our ereading adventures, we're so often left in the agog as books we don't want to read download themselves and, gee, those page turns are so slow. Until now it's been like we've been ereading from the passenger seat of a Lada gone rogue. Anyway. If souped up metaphors are your thing, or you just like the sound of a high-res non-Kindle ereader, the Kobo Aura HD could be for you. Pre-orders open in North America tomorrow, with the Kobo Aura HD release date set for April 25 in the UK and Canada, with other international markets getting it in May. As for pricing, the Aura HD is stomping on the Kindle Fire's turf: $169.99 in the US and £139.99 in the UK. But it's more expensive than the Kindle Paperwhite and nearly twice the price of the regular Kindle. Is a higher resolution screen and Porsche-referencing marketing speak enough to sway you?